Jet2 flight 271, a Boeing 757-200, suffered a tail strike accident on landing at Alicante Airport in Spain. The aircraft originated from Leeds/Bradford Airport, U.K. at 08:13 UTC (09:13 LT). The crew consisted of the line supervising captain, the copilot and a line training captain, sitting in the observation seat, to evaluate the copilot for his completion of line training. The copilot was the aircraft's pilot flying (PF) during the whole route. 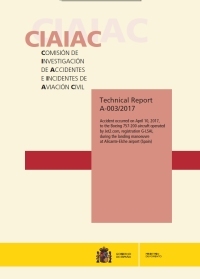 The flight went smoothly and the crew carried out the final ILS Z approach manoeuvre for runway 10 at the Alicante-Elche Airport maintaining stabilized approach parameters as described in the operator's manual. Nine seconds after starting the landing flare manoeuvre, touchdown was made with a pitch attitude of 5°, a calibrated speed of 119 kt and a vertical descent speed of 240 fpm. There was a vertical acceleration of 1.45 G corresponding to a firm impact. The flare manoeuvre was considered slow, which the manufacturer identifies as a risk factor for tail strike. The position of the control column was slackened slightly after touchdown was made, but the pitch attitude tendency continued to increase until it reached a value of 10.2°, reaching a 1.14 G vertical acceleration value. This attitude was maintained for one second, causing the rear of the aircraft to strike the runway surface. After the tail area had struck the runway, the captain took control of the aircraft and continued the landing manoeuvre, completing it without any additional problems. The flight crew were unaware that the aircraft's tail area had touched the runway until they were informed at the parking area by one of the cabin crew that they had heard an unusual noise when landing. The aircraft suffered damage to the lower part of the tail cone. All the people on board disembarked normally without any medical attention being required. The investigation has determined that the cause of the accident was incorrect pitch position control during landing. As a contributing factor, the fact that the aircraft captain (PM) could have intervened before the accident to correct the situation is highlighted. La distance entre Leeds/Bradford Airport et Alicante Airport est de 1722 km (1076 miles).